The Writeous Babe Project: Forgive me, sir, but I was wrong when I said feminism has nothing to do with you. Forgive me, sir, but I was wrong when I said feminism has nothing to do with you. When I came out as a feminist I felt I had an entire city celebrating with me. I use the phrase "came out" in an attempt to reflect the gravity of a Christian gal from Birmingham, Alabama identifying as a feminist. Many of the churches I've attended in the Deep South consider feminists to be women whose hobbies include witchcraft, killing babies, and emasculating men. Thus, calling myself a feminist is pretty big deal. I kind of cheated. I came out as a feminist in a column I wrote for a paper not in Birmingham, but in Louisville -- a Kentucky city that isn't quite sure if it's Midwestern or Southern. The paper was also mostly read by residents in their 20s and 30s. When the column was published my email inbox was flooded with messages from other women who shared my beliefs. The owner of a local boutique cut out the article, taped it to one of the walls of her store and wrote above it: "We love Javacia." The purpose of the article was not only to announce that I was a feminist, but also to dispel the myth that feminism is about emasculating men. But looking back, I wish I could change the headline. 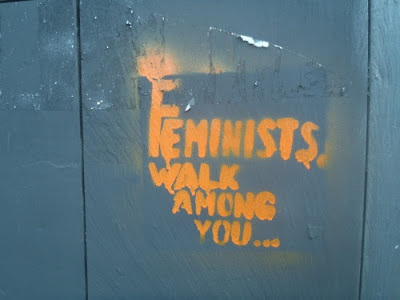 It read: "Excuse me, sir, but feminism has nothing to do with you." And now I know that simply isn't true. I was young when I wrote that -- only 25 or 26 years old -- and I had only identified as feminist for a couple of years. So I hadn't read much contemporary feminist writing and thus I hadn't realized how much men are hurt by sexism too. Gender stereotypes tell men they shouldn't show emotions. Gender stereotypes tell dads they're dumb and that if they decide to stay home with their children they aren't real men. And recently a man in Florida was told that he couldn't take his wife's last name, essentially, because men don't do that. According to a Reuters news report, Lazaro Sopena opted to change his name after his 2011 marriage to Hanh Dinh to help keep her family's name alive. He obtained a new passport and Social Security card and changed his bank account and credit cards before applying to update his drivers license. Following the same steps required of a woman who take her husband's last name, Dinh presented his marriage certificate to his local DMV and paid a small fee to get a new driver's license. But then a year later Dinh received a letter from Florida's DMV last December accusing him of "obtaining a driving license by fraud," and informing him that his license would be suspended at the end of the month. Dinh is fighting the DMV on the decision but was told that to change his name legally he has to go to court first and go through a process that takes several months and has a $400 filing fee. When he explained he was changing his name due to marriage, he was told "that only works for women." Only nine states enable a man to change his name upon marriage: California, New York, Hawaii, Louisiana, Massachusetts, Oregon, Iowa, Georgia and North Dakota. Apparently, it's OK for women to change their names after marriage because they're considered an extension of their husbands. And the fact that there may be men (and women) reading about this story and thinking that it's absurd for a man to take his wife's name is just more proof that the feminist movement is still needed for both women and men alike. Wow! That is such a surprising story. I get why he wants to change his name and I think that's actually really loving of him. I really don't call myself a feminist or anti-feminist, I know what I believe in and disagree with. I do think it's sad that in AMERICA, a "free" country, a man can't change his name for his wife. Whaaa? I was very surprised by this story too. I attended a wedding here in Alabama this September in which the young man changed his last name to his wife's. I sure hope he doesn't run into the trouble this poor man has! Great post, Javacia. I'm startled that this man has run up against these barriers, and in Florida (the state where I was raised) too! I was very shocked too!